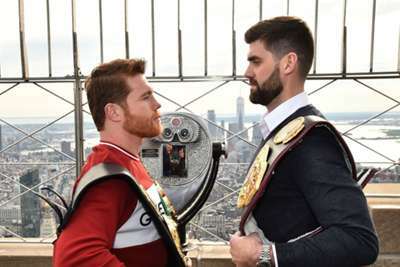 Saul 'Canelo' Alvarez believes stepping up to 168lbs to face Rocky Fielding is a risk but the Mexican superstar insists he will go for the knockout on Saturday. Following his gripping points win over the previously undefeated Gennady Golovkin at middleweight, Alvarez is aiming to become a three-weight world champion by ripping the WBA 'regular' super-middleweight belt from Fielding at New York's Madison Square Garden. The Golovkin blockbuster was Alvarez's 50th career victory and he is a huge favourite to see off Fielding (27 wins, one loss), having mixed with higher calibre opposition more often. Nevertheless, the 28-year-old knows facing a naturally bigger man, who upset the odds to win his title by stopping Tyron Zeuge away from home in Germany five months ago, presents potential problems. "That's the risk. To be moving up in weight to fight someone who's used to fighting stronger fighters, used to taking stronger punches," Alvarez told Omnisport. "I know the challenge but I like the challenge and I'm happy for it." Alvarez's promoter, the former six-weight world champion Oscar De La Hoya, knows all about the potential pitfalls of moving through the divisions. De La Hoya's 2004 attempt to unify the middleweight titles came up short when Bernard Hopkins crumpled him with a body shot in the ninth round. "When I was in the middle of the ring, just the size difference was too much for me," he told Omnisport of his encounter with Hopkins, who is now a partner in De La Hoya's Golden Boy Promotions outfit. "The punches were stronger, the weight that he was putting on me was getting me tired. By the time it was the seventh or eighth round I was exhausted. "Obviously he knew how to use his experience to eventually stop me." It means Alvarez might be advised to close the show early against Fielding and – after sharing 24 gripping rounds with Golovkin – he will need little invitation should the opportunity present itself. "Winning by KO is always something that one wants and what one looks for," he said. "For people too, it's a better show. They leave happier when it's a win by knockout. "So, I'll try and I'll work to finish it by knockout. But, if not, I'm ready for anything because I know he's a strong fighter." Saturday's bout is the first of Alvarez's 11-fight deal with sports streaming service DAZN worth $365million. For Fielding, it represents an unexpected shot at the bigtime at a venue steeped in boxing history. It is one the 31-year-old is determined to grab with both of his heavy hands. "I'm coming to the biggest arena in boxing against the biggest name," Fielding told Omnisport. "I'm a fighter; if you want to be the best you've got to fight the best. "It got presented to me, I got the phone call and I'm not going to knock it back. I'm challenging myself and I'm here. "I've put everything into it and I'm here, ready to go."